Hi guys, I'm back with another post on Bluefly.com. Last year I made a post about it as a way of introducing it to you guys because I do believe that it's a great online shop for fashionistas to check out. 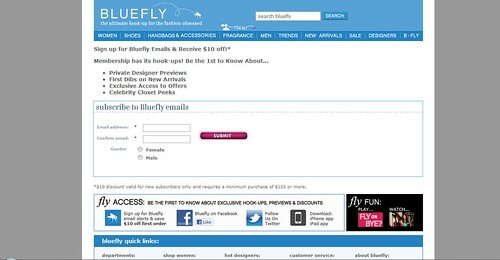 If Bluefly.com doesn't ring a bell, you can check out my previous post on it here. For this post, I'll be focusing on one very famous Italian brand that most if not all of us know, despite whether or not you are interested in fashion. One of the Italian fashion brands that I focused on last year for my project was Prada and to my slight surprise I see that Bluefly carries authentic Prada items. What I love about Bluefly is that there is a section for Recent Product Reviews and it is the first thing that shows up when you click on a brand. This is really convenient for buyers so that they can read about previous customers' opinions/ratings before they decide make a transaction. This also tells me that Bluefly takes their customers seriously and are able to be honest and loyal to future customers. It's reasonable for them to sort their reviews from highest to lowest rating and I'm really glad that Bluefly didn't try to conceal any low ratings on their site. I'd actually find it really helpful knowing that a pair of expensive Prada shoes were a bit uncomfortable to someone else. I'd rather know than feel regretful after purchasing and I'm sure that Bluefly wouldn't want to hear complaints from their customers. So in a way, it's a win-win situation. Now I really want some new shoes! It's been a while since I last visited their site before this so it's great to see that Bluefly has still continued to impress me with their new features. If you're really interested in purchasing from them, you can sign up for Bluefly emails and receive $10 off your purchase! Click on the image below to direct you to the sign-up page. I never heard of Bluefly till today, looks great, I’ll have to check it out. this seems like a great site for deals but i hear the return policies are terrible. although, i'm not one to return stuff anyway haha.